The Hierophant is the fifth card of the Major Arcana set. 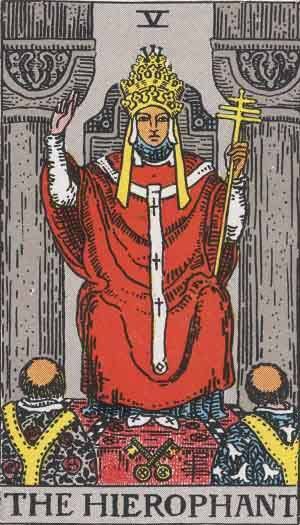 The Hierophant resembles a pope or religious leader (he is sometimes named ‘The Pope’ or ‘The High Priest’, mirroring ‘The High Priestess‘). Another masculine card after ‘The Emperor‘, The Hierophant has similar values of orthodoxy and stability, the same way that a King and a Pope are both important figures. The Hierophant represents the deep importance of spirituality and religion in regards to the aspects of your life. Past – The Hierophant in the past position could represent a past allegiance or membership of a group, club, or even a strong ethnic bond that has moulded how you think and feel. Perhaps you were brought up in a strong religious family. It could still be affecting the way you think about certain topics. Remember that you’re an individual and you need to make your own mind up, rather than listen to dogma. Present – The Hierophant in the present position could represent a new belief system taking hold, or a new cause to fight for. Right now, you might feel a bit lost or aimless, but don’t act irrationally. It’s not a time to jump in and act without planning. Looking at established material in the field you’re interested in will help you hone and perfect yourself. Know yourself. Future – You don’t really need to plan. Just letting the paths of the future wind act as they want will be enough. Eventually it will work out, but not in regards to mundane matters, something great is coming. Work / Education – The Hierophant in regards to work suggests a possible culmination or transfer to a new area. A new job isn’t off the cards, and working with new people is likely. Romance – The Hierophant in regards to romance means good things. Someone you already know may be interested in you. It’s likely someone you’ve known for a while. If you’re in a relationship now, expect things to continue as they have done recently. Friends – The Hierophant suggests that not much is going to change in regards to friendship. Keep up your commitments to maintain your friends, starting a new group activity together is a good bet if you’re stuck for something to do. Money – The Hierophant in regards to finances reminds you to do make dangerous purchases or investments. Stay risk-free for a while and ask for advice from people ‘in the know’ if you’re looking to get a discount. If in doubt, shop around. Health – Don’t worry about your health, but look for ways to eat better and exercise more. Stick to that routine you said you’d keep to. Fad diets do more damage to your body so just stick to it. You can do it and you will do it. It is a shame to not be able to see your own body at it’s potential high. Spirituality and Mentality – The Hierophant, as his religious appearance suggest, is tied to spirituality. The traditional aspect plays through. If you’re looking for inspiration, spirituality and religion may interest you. If you are religious, look closer at your religion and try to apply some of the core aspects into your daily life. The golden rule, as ever, is worth including everywhere. The Hierophant in the Rider Waite deck is illustrated in a similar way to some other cards. Like The Emperor, he sits on a throne. Like The High Priestess, he sits between two pillars. The Hierophant has aspects of both of these; the traditional aspects of The Emperor and the forethought and intuition of The Empress. Further reinforcing the religion connotation is the ‘benediction’ posture in his right hand. In reverse, The Hierophant can represent a lack of spirituality in your life. This won’t exactly reflect in lack of religion, but you may be feeling an exact lack of purpose or drive to get going. What get’s you up in the morning? What do you want to achieve? Are you fully in control of your life? Look for the areas of your life that are not under your control and take the reins yourself. You cannot let others control you. Tradition, Religion, Convention, Guru, Mysticism. We’ve selected live tarot readers to give you a FREE 3 Minute interpretation of The Hierophant! Scroll through them below and pick your favorite one.